Folders & Tags. You can see for each Folder and Tag how many documents there are and how many people have permission to see them And click on any Folder or Tag to see all those documents. Recent Activity. 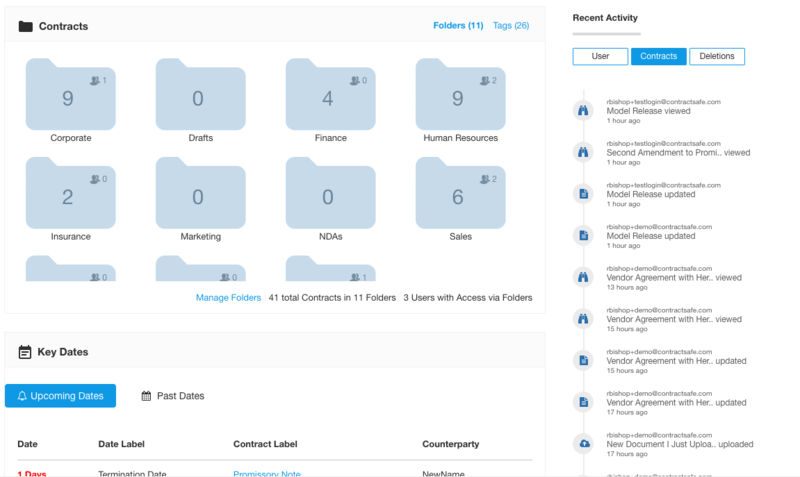 This area shows you the audit trail for user activity, contract activity and (importantly!) if any documents were deleted. Key Dates. You can quickly see any upcoming contract dates at a glance. Or switch over and take a look at any contract dates that may have just passed. If you don’t like change (or just don’t like this change), set your start page to the Contracts page. It will be just like the good old days! Indicator bar at the top for critical information like Active, Fully Executed, Autorenew, Reminders, and Shared Access. See the Parties without opening a different section. Easy access to assign Folders and Tags. Notes are always immediately visible to anyone getting contract details. Dates and Reminders are open by default. Easy to quickly click between other options. Save Button! Don’t worry . . . we still autosave everything for you. But many of our customers are the “belt and suspenders” type :-). It is contract software after all. They want a Save button to click. So now you have one! If you want to use one. Purely optional. Push it as often as you like. Now you can search (and add contracts) from any page of the site. And to get to your Settings or to log out, just click on the head in the upper right. We’re excited about these changes and hope you will love them as much as we do! Good or bad, please let us know what you think. We really appreciate your feedback! Drop us a line at feedback@contractsafe.com.